The weekend of June 6th had several firsts: the first Cat Convention in the world, the first time I met a cat celebrity, and the first time I teamed up with my sis, Brittany High, to create a video for her website, Incredible Things! The team behind CatCon bills it “like ComicCon, but for Cat People.” I’ve never been to ComicCon, but I’m pretty sure it’s like CatCon… for entertainment nerds. There was just about anything “cat” that you would want to buy; including caricatures of your cat (who was not allowed to attend the convention), a cameo-style silhouette of your cat (or dog, shhhh), and insert cat-themed product here. Everyone was very kind and we had a good time. The only problem I had was with Pudge the Cat when I disturbed her sleep for a selfie. She did not approve. And understandably so. 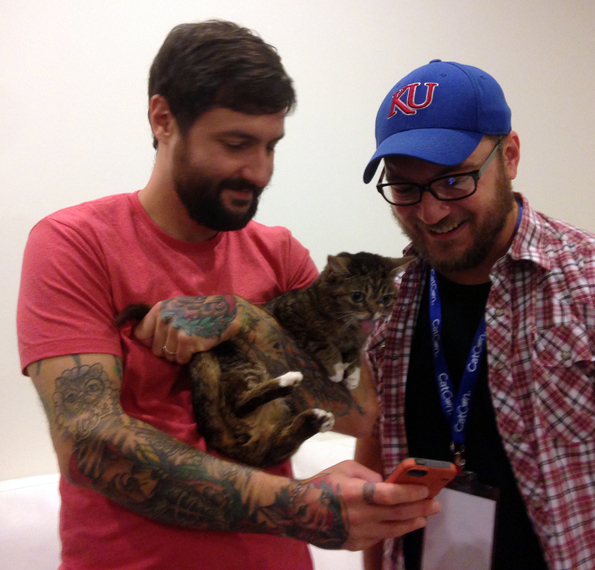 Here’s a more successful selfie (behind-the-scenes) with Lil Bub and Mike.